Delivery single payment of £4.00 for any number of items (Inc. VAT), or FREE if you spend over £400. 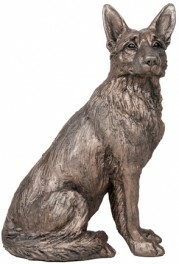 Duke the loyal Alsatian dog sculpted by Harriet Dunn. Created from cold cast bronze.